With action MORPGs becoming even more mainstream in the F2P market, it’s now time to take a look back at one particular action MORPG that appeared on western shores several years ago, arguably starting the craze. 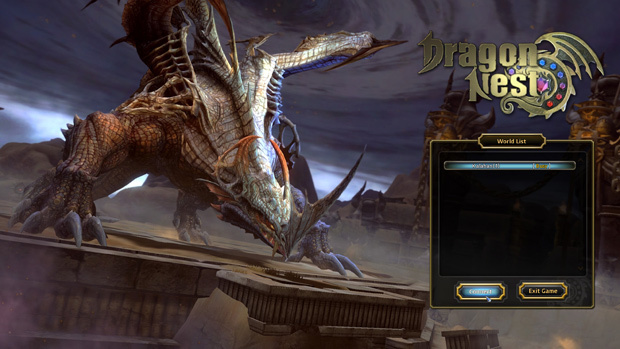 Dragon Nest is developed by Eyedentity games and published by Nexon America. It now features six different class types, multiple sub-classes and a level 60 cap that will give players weeks of monsters to beat up along the way. Initial character creation comes with few options. Players will have the choice between a handful of face types, clothing and hair colors. Besides the six classes you can choose from, which are all gender locked, there are no other options available to make your player stand out from the get-go. The only way to make your character look unique is by obtaining avatar items from completing special quests and events, or by purchasing them from the Dragon Vault. The only issue with both these methods is that avatar items earned by events and quests are only temporary, and the ones from the Dragon Vault can only be obtained using real money or with “Dragon Scales”, another form of currency that can be earned from events, but have a set expiration date. What may also raise concerns is that avatar items generally have extra stats tied to them. This could be seen as a form of buying power, but combat in Dragon Nest puts a fair emphasis on skill over stats and in some cases, players with those extra stats can be subjected to equalized PvP which will render those extra stats as meaningless. Of course, if a player still needs those extra stats in order to feel adequate, but doesn’t have the time, money or scales to obtain them, they could always “beg” another player in order to get them. No seriously.. 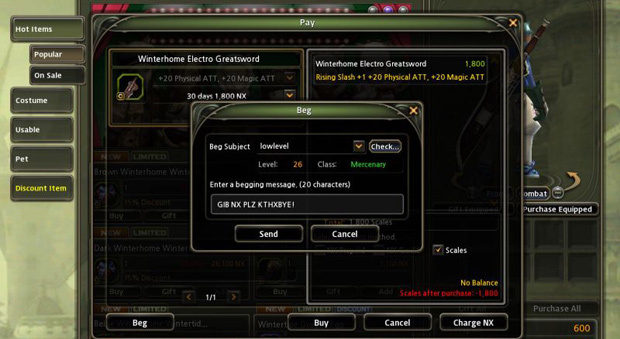 The Dragon Vault comes equipped with the option to beg other players for items from the shop. Other forms of customization include enchantments and lustres that can be used to enhance and unlock extra stats or passive abilities for equipment. These items can be found just about everywhere, and players will always end up with at least one of these in their inventory by the end of a single dungeon run. The combat system uses a familiar TPS style control scheme, which means WASD is for movement, spacebar for jumping and mouse for aiming primary and secondary attacks. Getting a hang of the default control scheme will be easy enough if the player has ever tried an FPS or TPS game before, but later on, it may become a challenge in of its own. Around LV15 when sub-classes become available, players will gain access to several different skills that can be activated using the 1 through 0 keys. These skills can have multiple uses and can be activated several times before initiating cooldowns. 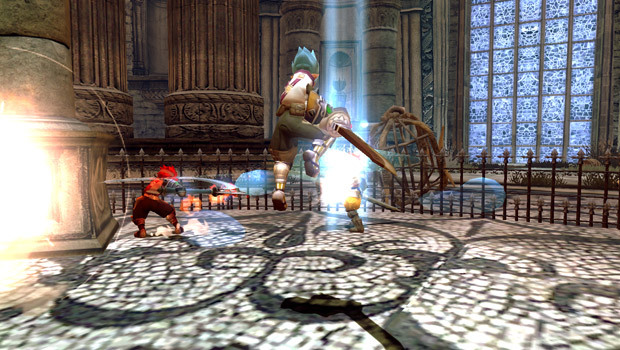 Due to the game’s fast-paced nature, it can be fairly difficult to execute the right move at the right time, because when every enemy on screen is gunning for the player’s head, there may be times when the player will end up pressing the wrong skill at the right time, and getting used to a default control scheme like this almost feels like learning how to touch type for the first time in grade school. 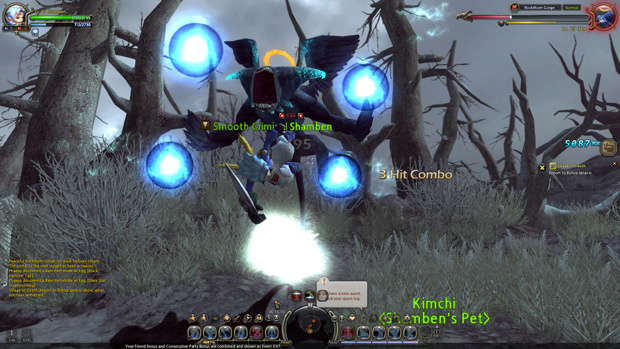 In short, the default control scheme for Dragon Nest is simply not up to the task, so players should re-configure their controls to better suit the gameplay. 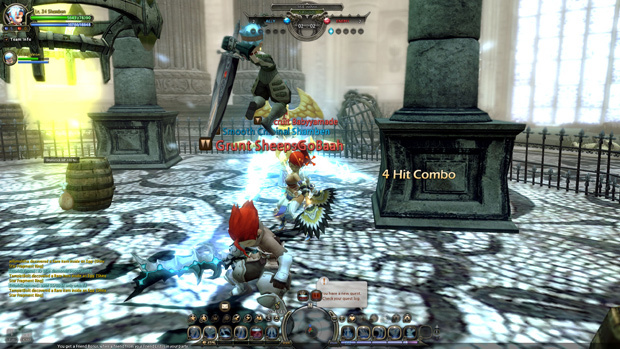 Compared to many other action MORPGs, Dragon Nest has one of the fastest combat systems out there. Players can run, jump, batter, bruise and destroy everything at a breakneck pace. The game even rewards players with points for destroying as much as they can, as fast as they can, right before defeating the final boss of each instance. 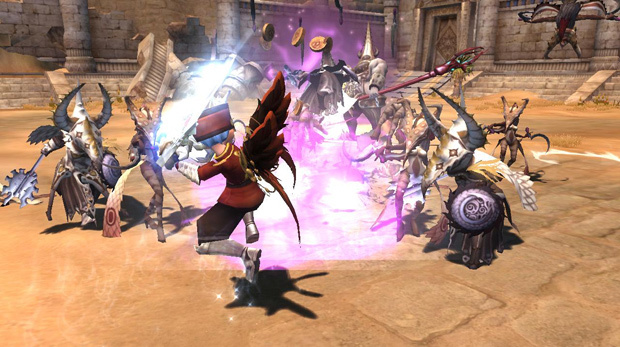 Another element that makes Dragon Nest’s combat so enjoyable is that almost every attack can be cancelled on hit or after, allowing players to extend combos and juggles near endlessly. Since combat uses a TPS style control scheme, attacks (for the most part) will need to be on-point in order for them to connect. Even melee classes will have to aim and watch their distance between themselves and their enemies in order to play effectively. One downside with Dragon Nest’s combat, however, is that skills have cooldown timers attached to them. While the intentions for these cooldowns are obviously to prevent exploits such as infinite combos (since nobody wants to watch helplessly as their character gets destroyed in a huge 100% to 0% HP juggle), this also prevents the gameplay from reaching heights of crazy combat that were made possible in games such as Devil May Cry 3 and 4, which would have really made Dragon Nest stand out even more, PvE wise. PvP modes are available as early as LV10, and it’s a whole different ball game compared to PvE. Along with the insanely long juggle combos, PvP combat is just as hectic and fast-paced, but one major difference is that players now have to deal with a damage threshold meter during combat. This meter determines how long a player can combo an enemy before they become temporarily immune to damage, so players must figure out how to maximize damage and which moves work best to create the perfect combo sandwich. There are a handful of different game modes and options to choose from in PvP, such as objective based game modes similar to Capture the Flag, or classic modes like Free-For-Alls and Team Deathmatch. One feature that will help ease new players into PvP, as well as (attempt to) create a fair playing field is the equalized stat option. Players that are just starting out can have the same stats as a player who is already at max level. Of course, higher level players will still have a considerable advantage over low levels simply due to the fact that they’ll have a much wider array of skills and abilities at their disposal. Interestingly enough, it seems that each class type in PvP could be considered a particular archetype in a fighting game. Since the warrior is the only class that can perform a running sprint on the ground, they could be considered a “rush down”-type character, the archer mainly uses ranged attacks which could count as a zoning-type, the mage who uses teleports could be seen as a dynamic “keep away”-type character, and so on. 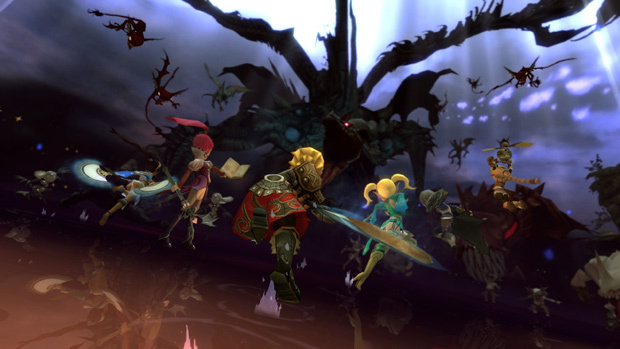 Killing wave after wave of enemies in Dragon Nest has a satisfying feel as every hit gives a real sense of impact. Despite this, repetition does set in early, as the game will send players off to revisit dungeons that they’ve already completed multiple times. Even as early as LV5, I was sent off to battle in a low-tier dungeon about four times in order to complete all main and sub-quests I had for it. As per usual, the best way to combat the repetition is by playing the game with some good friends, or just random folks in general since players will be able to breeze through at a much faster rate, but it only helps by a small amount as quests will continue to be piled on and on as players progress. The amount of quests that players will have access to are so plentiful that most players will be overleveled by the time the quest is completed. 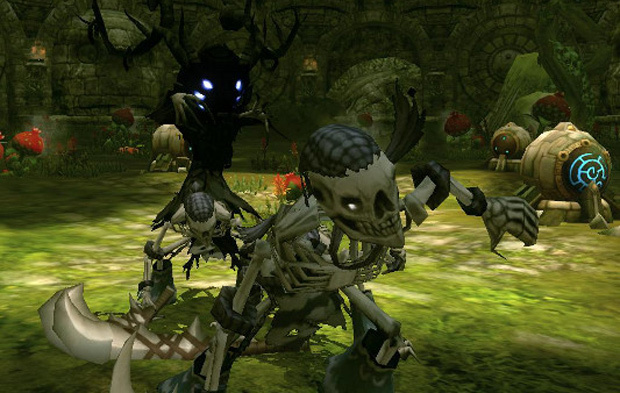 The visuals for Dragon Nest have this nostalgic look and feel to it, almost seemingly like an early Dreamcast game. It’s certainly nice to have another F2P online game that’s brimming with life and color, but the low quality of the textures and the low polygon count could have been bumped up a tad bit to make the game feel a little bit more presentable. Still, the benefit for having these kinds of visuals will mean that Dragon Nest should hold up well on many older PC builds. The sound design is also fairly decent, with voice acting that comes off as cheesy, but it also helps to give Dragon Nest a bit of personality. Music that plays during battles is engaging enough, but comes off as generic and ultimately forgettable. Dragon Nest’s community features come complete with friend lists, player guilds, custom chat channels and even a farming area for players to hang out and socialize in. Anyone that has a competitive side will also enjoy various guild vs. guild competitions, along with weekly/monthly ladder rankings. There’s even a mentor system for players to learn and grow from others as they level up and earn extra goodies on the side. As for the actual community: There’s a fair amount of friendly players that are willing to help newbies out. Occasionally, you may run into a few salty individuals, especially during PvP sessions, but these kinds of players are few and far between. Besides from a few quirks, Dragon Nest provides an enjoyable experience with fast-paced gameplay that many other action MORPGs barely come close to reaching. Whether you’re a casual or competitive gamer that wants a good action fix, Dragon Nest in the year of 2014 will do nicely to fit the bill. You just summed up every Nexon game ever. USe Cherry Credits SEA version. I use it and I am in France. No lag. Need a decent proxy to play SEA.. I like this game. The PvE being compared to Devil may Cry is way off. PVE is fine. PvP started broke. So broke, they built in in the game as a second thought after the game was released. It has been patched a little, but PvP is just not good at all. The repetitveness of instances is NOT bad if you are doing it for questing. 5 times is LOW, compared to other games like Vindictus….This author seems to have forgoten to compare this game to Rusty hearts, Vindictus, C9….You know…the OTHER MMO Instance based games…not Devil May CRY! FAIL! Any ways, yeah, probably the best dungeon crawler out there but my only problem that keeps me away is community. The chat and guild and group function has been and always will be broke. LEaving MMO part out. The maority of people are cramped in in end game elite guilds and RARE is it to find a decent group to push on. Leaving you stuck behind a nest until you grind out up and out. It is sad since it has so much potential and all it takes is a little patch to and tweaks to fix grouping mechanics. Well I actually have played the other Action MORPGs you mentioned. Personally I felt that both Vindictus and Dragon Nest suffered from repetition a bit too much due to the questing. C9 comes close to the style of gameplay that Dragon Nest has, but I felt Dragon Nest had a way faster pacing in terms of overall combat. Plus it just felt more polished. Plus, I wasn’t so much as making a comparison to DMC, but just stating more of a “What if”, because the gameplay would probably have come closer to it if they has just tweaked it a little. …but then again, Kritika may end up getting an English release soon, and that will definitely be as close to an online Devil May Cry as we’re ever going to get. There was always something about Dragon Nest’s gender locked classes. For one thing, it’s obviously lame. On another, they did it in a way where… I wasn’t too bothered. It wasn’t like C9, Vindictus, and other games with gender locked classes where the characters were overly unique: it still looks quite generic, which is a good thing since if it wasn’t gender locked then that would be the feel of it in the first place. Costumes / Cash Gear does give stats. This, however, is only a small boost, unless you are using RARE grade costumes (which are hard to get, even when paying cash). Truthfully, you really, really don’t need costumes at all to be sufficient, if not, above average in PvE. It all comes down to your actual gear which, with some gold and some luck, can greatly surpass the benefits of buying cash costumes. Without Magic Grade costumes, the most common type that everyone has, you will be down by about 2-5% of everything. And of course, if anything, skilled+average gear > bad+great gear in PvE to a certain extent. This will definitely hold true in 70 cap, especially when they change how some of the gear works with jades. PvP is indeed an afterthought of the developers when the game was made, so don’t expect it to be great. While it could have been great, and it is when it isn’t lagging, the way it works in DN NA is terrible. Laggy, ghosting, and on eyedentity’s part, a bit unbalanced. The only modes worth doing are the endless group PvP rooms and Ghouls. Combat is superb. The animations flow smoothly from one attack to the next. While you don’t necessarily need awesome combos for PvE, it still benefits greatly when it comes to getting faster and more efficient runs. And for harder nest / raid bosses, you definitely need to know how to deal damage other than smashing everything or else you’ll get smacked down hard and die quickly. Even today, after months of Desert Dragon Normal being release, only a handful of teams actually beat it. The community can put off some people that are new to the game. It is true that the majority of the people are cramped in end game guilds. The solution? Join them. I myself am in one of the most well known guilds in DN NA and has been around many of the other big name guilds as well. There is A LOT of room. Most of the space is being occupied by alt characters. And most of the time, they are happy to find new players to help so they can have more teams and better availability for nests since more runs with more characters equals more loot and of course, don’t have to fill parties with other randoms. Once you get to know the people well, they’ll start helping you gear up without questioning it. Soloing in this game is not possible to do without sacrificing a lot. Going with random parties is a terrible idea and is always done as a last resort. I said earlier that PvP is indeed laggy. As for PvE, it is the sort of the opposite. The game runs fine, hardly noticeable lag. This is probably due to PvP having a lot to do with peers (if one is lagging, the match is screwed for both), so you don’t have to worry about PvE. Nexon’s name has tainted the game’s name as well and has put off probably 60% of the people even willing to try Dragon Nest. I urge you to try it, just not around winter, spring break, and usually sundays, as those are the times it has been the worst. The Nexon team behind Dragon Nest is definitely superb, which is quite surprising. They read the forums daily. They recognize and compensate for the issues, working overtime to get some things fixed and running. Tickets are answered fairly quickly (if submitted to the right section). It’s funny how the team is actually… good. They even hop in the game and run basic dungeons/nests on some occasions, which is also cool. As for actual PvE repetitiveness, the 5 limit thing and PWR limit basically reduces the need to grind it out for hours. You can be done with PvE for the week in a playtime of maybe 2 days at maximum. I thought people didn’t want to grind? If you are looking to get into PvE, now is actually NOT the time to do it. Wait until 70 cap, when PvE gets totally revamped mechanic wise and is a lot more fun. You can look it up on youtube and such since the asian versions already have them. Lastly, on the topic of future content, there are six classes: 2 males, 4 females, highly skewed. The females basically cover the need for a mage-type class(sorc, alchemist, dark summoner), an agility-type class(sniper, engineer, acrobat) , and a fighter-type class (blade dancer, acrobat to a certain extent), but males only have fighter (warrior) and mage (cleric) looking classes. There will in fact be a 7th class, which is actually due to arrive in at least 2 months called the Assassin, which basically fills the void for the 3rd type. If you are looking for a male class that is quick on their feet, can be either a mage-like class (Bringers -> Light Fury / Abyss Walker) or more like a male acrobat (Chaser -> Raven / Ripper), and don’t want to be female, this is basically for you. TL;DR: Dragon Nest is very worth it at the beginning of 70 cap, don’t bother trying it now unless you really want to be prepared for it. You forgot to review the stability of the game. Since October it’s had almost 25% downtime. Of course there is weeks worth of of content, because the game rarely works on the weekend. 25%? Yikes, that sounds awful. But it’s not surprising since it IS Nexon America, the same publisher that took TWO YEARS to respond to my support ticket regarding my hacked account for Dungeon Fighter Online. Yes… Two. Whole. Years. I’m dead seriously. Luckily for me, I was able to play without many downtime issues, since I was mostly playing on and off before completing this article.